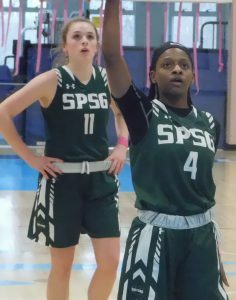 St. Paul’s School, with Destiny Ryles (4) and Devan Conrad, is off to the IAAM B Conference basketball final after a semifinal victory over No. 12 Mount Carmel. Ryles finished with 30 points as the No. 17 Gators will play No. 5 Mount de Sales Academy for the title, Sunday afternoon at 4 p.m. at Stevenson University. St. Paul’s School basketball team knew the odds were against them in Friday’s IAAM A Conference semifinals. Thanks to two key regular season road losses, the Gators were left with a return trip to Mount Carmel. The proverbial third time was the charm. The No. 17 Gators scratched out a 65-59 decision over the 12th-ranked Cougars for a Championship Sunday reservation at Stevenson University. Junior guard Destiny Ryles scored a game-high 30 points and freshman Laurie Satchell added 10 for St. Paul’s (17-3 overall). Ariana Alleyne led Mount Carmel with 14 points and Ayana Brim finished with 13 points. Led by a relentless performance from Ryles, the resilient Gators made the neccessary plays to move a step closer to their first title in nearly a decade. St. Paul’s will play top-seed and No. 5 Mount de Sales Academy for the IAAM B title, Sunday afternoon at 4 p.m. in Owings Mills. The Gators lost their first league decision at Mount de Sales last month. Nearly two weeks later, Mount Carmel held off St. Paul’s, leaving the Gators with the No. 3 playoff seed. Victory was the only option Friday for St. Paul’s. “I feel like this team just brought it all tonight,” said Ryles. Ryles was especially clutch from the free throw line as St. Paul’s withstood a Mount Carmel charge after building an 11-point advantage early in the second half. Junior Alex Sawyers netted nine points to aid the Gators’ cause. The 5-foot-5 guard scored her team’s final eight points in the opening quarter, leaving St. Paul’s with a 17-14 lead. The Gators upped the lead to 28-21 at intermission before Ava Wax started the second half with a pair of 3-pointers, leaving the visitors with a 34-23 advantage. The Cougars sliced the margin to four, but Ryles and Sawyers converted tough contested jumpers. Another key factor for St. Paul’s was a plus-18 rebounding margin. “We all contributed to this game, not just me,” said Ryles. 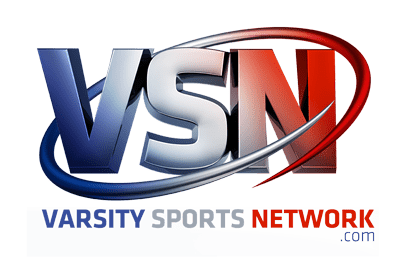 It was a disappointing end to a breakout season for Mount Carmel (19-8), which gained its first-ever VSN Top 20 ranking in January, only to lose back-to-back games at the Basketball Academy at Morgan State. The Old Eastern Avenue school rebounded with seven victories in its final nine decisions, including an improbable comeback win over Anne Arundel County powerhouse Old Mill at the Public vs. Private Challenge. Mount Carmel won 10 games last season. St. Paul’s will try to spoil Mount de Sales’ bid for perfection Sunday. The Sailors, who haven’t loss a league decision this winter, defeated the Gators, 62-46, in Catonsville last month. The Gators will seek their first title since beating St. Mary’s for the B crown in 2009.